A new experiment, launching today online, aims to help ‘inoculate’ against disinformation by providing a small dose of perspective from a “fake news tycoon”. A pilot study has shown some early success in building resistance to fake news among teenagers. 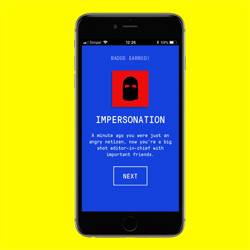 A new online game puts players in the shoes of an aspiring propagandist to give the public a taste of the techniques and motivations behind the spread of disinformation – potentially “inoculating” them against the influence of so-called fake news in the process. Researchers at the University of Cambridge have already shown that briefly exposing people to tactics used by fake news producers can act as a “psychological vaccine” against bogus anti-science campaigns. While the previous study focused on disinformation about climate science, the new online game is an experiment in providing “general immunity” against the wide range of fake news that has infected public debate. The game encourages players to stoke anger, mistrust and fear in the public by manipulating digital news and social media within the simulation. Players build audiences for their fake news sites by publishing polarising falsehoods, deploying twitter bots, photo-shopping evidence, and inciting conspiracy theories in the wake of public tragedy – all while maintaining a “credibility score” to remain as persuasive as possible. A pilot study conducted with teenagers in a Dutch high school used an early paper-and-pen trial of the game, and showed the perceived “reliability” of fake news to be diminished in those that played compared to a control group. The research and education project, a collaboration between Cambridge researchers and Dutch media collective DROG, is launching an English version of the game online today at www.fakenewsgame.org. “A biological vaccine administers a small dose of the disease to build immunity. Similarly, inoculation theory suggests that exposure to a weak or demystified version of an argument makes it easier to refute when confronted with more persuasive claims,” says Dr Sander van der Linden, Director of Cambridge University’s Social Decision-Making Lab. Based in part on existing studies of online propaganda, and taking cues from actual conspiracy theories about organisations such as the United Nations, the game is set to be translated for countries such as Ukraine, where disinformation casts a heavy shadow. There are also plans to adapt the framework of the game for anti-radicalisation purposes, as many of the same manipulation techniques – using false information to provoke intense emotions, for example – are commonly deployed by recruiters for religious extremist groups. “You don’t have to be a master spin doctor to create effective disinformation. Anyone can start a site and artificially amplify it through twitter bots, for example. But recognising and resisting fake news doesn’t require a PhD in media studies either,” says Jon Roozenbeek, a researcher from Cambridge’s Department of Slavonic Studies and one of the game’s designers. Roozenbeek points out that some efforts to combat fake news are seen as ideologically charged. “The framework of our game allows players to lean towards the left or right of the political spectrum. It’s the experience of misleading through news that counts,” he says. The pilot study in the Netherlands using a paper version of the game involved 95 students with an average age of 16, randomly divided into treatment and control. This version of the game focused on the refugee crisis, and all participants were randomly presented with fabricated news articles on the topic at the end of the experiment. The treatment group were assigned roles – alarmist, denier, conspiracy theorist or clickbait monger – and tasked with distorting a government fact sheet on asylum seekers using a set of cards outlining common propaganda tactics consistent with their role. They found fake news to be significantly less reliable than the control group, who had not produced their own fake article. Researchers describe the results of this small study as limited but promising. The study has been accepted for publication in the Journal of Risk Research. The team are aiming to take their “fake news vaccine” trials to the next level with today’s launch of the online game. With content written mostly by the Cambridge researchers along with Ruurd Oosterwoud, founder of DROG, the game only takes a few minutes to complete. The hope is that players will then share it to help create a large anonymous dataset of journeys through the game. The researchers can then use this data to refine techniques for increasing media literacy and fake news resilience in a ‘post-truth’ world. “We try to let players experience what it is like to create a filter bubble so they are more likely to realise they may be living in one,” adds van der Linden. A screen shot of the Fake News Game on a smart phone.